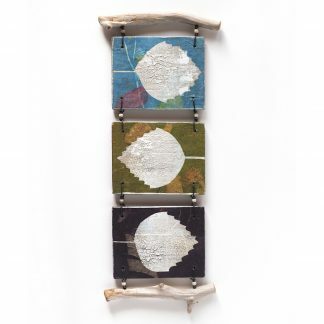 This rustic mixed media wall hanging consists of two reclaimed plywood panels and a piece of driftwood, laced together with antique brass finish wire accented with painted wooden beads. The panels feature two abstract collages of colorful perched birds on white and black backgrounds. Total height is 9 1/2″, total width is 4″ (24.1 cm x 10.2 cm).